It was an average day on Calaveras Lake, Texas. Anthony and his friends had already spent several hours on the water and had several baits in the water ranging from live perch to dead shrimp. While him and his friends were talking and hanging around on the boat, Anthony noticed one of his lines had started moving from the back of the boat around the side and to the front. Then all of a sudden the line tightens up and begins twisting around other rods, immediately bending all four rods that were in it’s path. Anthony and his friend ran over just in time and grabbed the pole, and as soon as he started reeling he could tell it was a big fish. To be a good friend, Anthony handed the rod over to his pal so he could catch his potential biggest fish yet. Anthony own’s Tux’s Fishing Carter, but this happened to be a casual day out with friends! Since Anthony has caught many fish in his days, he enjoys handing the rod over to see the excitement of reeling in a huge catch. 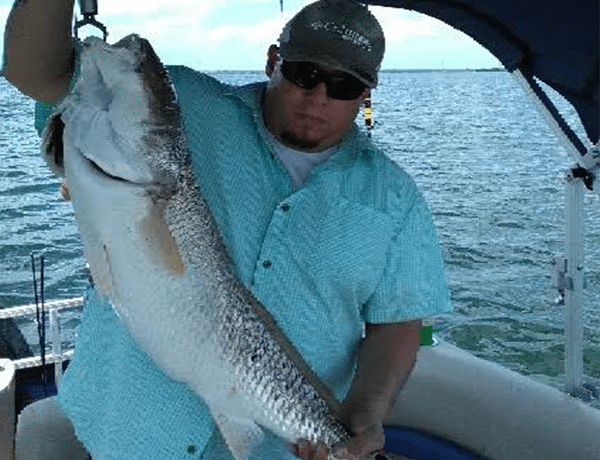 Finally they pulled a beautiful 36″ freshwater Red Fish on board! They’re weapon of choice? Electric Chicken Shrimp!